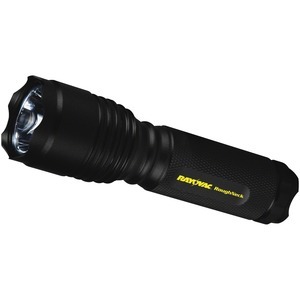 Hardworking flashlight features a high-performance Cree XPG LED with spot-to-flood adjustment. Three modes are high (220 Lumens), low (90 Lumens) and strobe. The beam distance is 479' (146 meters). Battery runtime varies with mode with 2 hours for high, 4.5 hours for low and 8 hours for strobe. Durable, water-resistant design includes an aircraft-grade aluminum body and a holster. RoughNeck 3AAA Tactical LED Flashlight also includes three AAA alkaline batteries.